If you are just now starting to learn about 3D printers, then chances are, you’re going to need some help when it comes to picking one out. Looking on the market, there are many different ones to choose from, so choosing the best out of all of them that claim to be the best isn’t going to be easy. 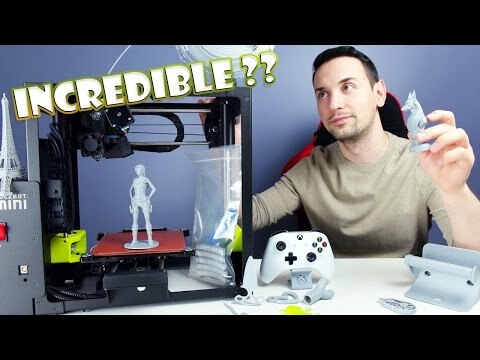 A couple of weeks ago, I came across the LulzBot Mini Desktop 3D Printer and I really liked what I read about it and I think you may like it as well. Starting out, before you buy a product, you probably want to learn about the company behind it. LulzBot may not be a name that you’re familiar with, so let me tell you a bit about the company. They are based on Colorado, USA, so the products will ship from the US and UK. They are an Aleph Objects, Inc. Internet store that is selling hardware, materials, tools, and electronics for RepRap 3D printers. Unfortunately, this printer doesn’t have any type of on-board controls or SD card slots, which is perfectly understandable for a mini. What this means is that you will have to connect it to a PC via a USB cable, which really isn’t all that hard. Print bed leveling is easy, because it’s done for you. That’s right, it has an automated bed-leveling sequence that will take care of everything for you. When you launch a print, it will start heating the print head first, then before probing the bed-leveling sensors, wipe the nozzle clean. Once this process is complete, the tool head will move into a holding position as it sits there and waits for the desired printing temperature to be reached. Once the desired temperature has been reached, the printing process will start. The start-up sequence for printing will take about four minutes, which is pretty good. The printer always follows this same routine, so it may get a bit annoying at times. During the first layers, if you would like to stop a print, and re-launch it immediately afterwards, you won’t be able to do this. The machine will first need to go through a cool down process, then wipe the nozzle, and do all of the other steps before it starts a new print. In the world of 3D printing, bed adhesion is a common problem, but this isn’t true with the LulzBot Mini Desktop 3D printer. LulzBot Mini’s PEI Surface has a heated glass bed that is responsible for keeping the prints in place, without having to use any form of glues or solvents. Many individuals love how the LulzBot works with a wide variety of mateirals. The operating temperature range of both the print bed and the hot end is wide enough to make it so that it can even cover materials like Polycarbonate and PLA. The LulzBot Mini is capable of printing Nylon, ABS, Polyester and Polycarbonate filaments. These materials can offer high temperature resistance along with greater strength, so they will last for a longer period of time. Some reviewers mentioned the noise levels being a bit too loud to their liking. While you’re at your desk trying to concentrate on something, you probably don’t want to use the printer because like most 3D printers on the market, may are noisy and can be distracting. You cannot print away from your computer, so you’re not able to move it to another location, which means you will have to deal with the noise. All in all, despite the noise (this is perfectly understandable for a 3D printer), the printer is well worth the price. Sure, the price may be a bit high, but if you’re able to afford it, I highly recommend buying it for all of the above reasons.